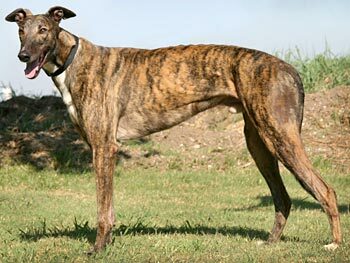 Bucky, aka Monetary, is a 3-year-old brindle male born March 23, 2007. His sire is the Irish-bred Maryville Rumble, and his dam is Simone. 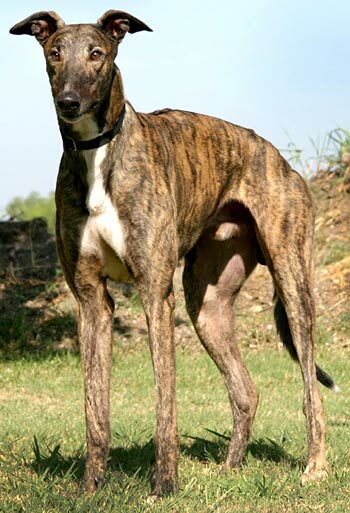 Bucky has 28 races to his credit starting at Valley Race Park in Harlingen, TX, on December 5, 2008, and finishing December 13, 2009, at Gulf Greyhound Park in LaMarque, TX, after competing at Wonderland Greyhound Park in MA. 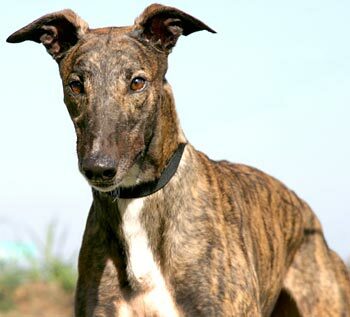 Bucky is a stunning greyhound with his wide tuxedo chest and throat. Bucky is not cat tolerant, and has not been tested with small animals at this time. Bucky is a great looking greyhound with a handsome dark face. He is super fun and happy, in fact I think he gets his name from the fact that he bounds out the door or "bucks" when he gets the chance to go outside and run. He often will "speak" or lightly bark at his toys when he's playing with them, and will throw them up gently in the air and try to catch them; he LOVES his toys! As spunky as he is, he has never once jumped up on me or any visitors to my home, though he is certainly curious about them. He's quick to check out how they smell...but he's also very respectful and leaves folks alone when told to. Bucky stays off the bed completely though he has tried to sneak up onto the sofa a couple times. He is a wagger and a "leaner", showing just how much he likes having a human there.